2018 was a special year for MCHS and all their sports teams. 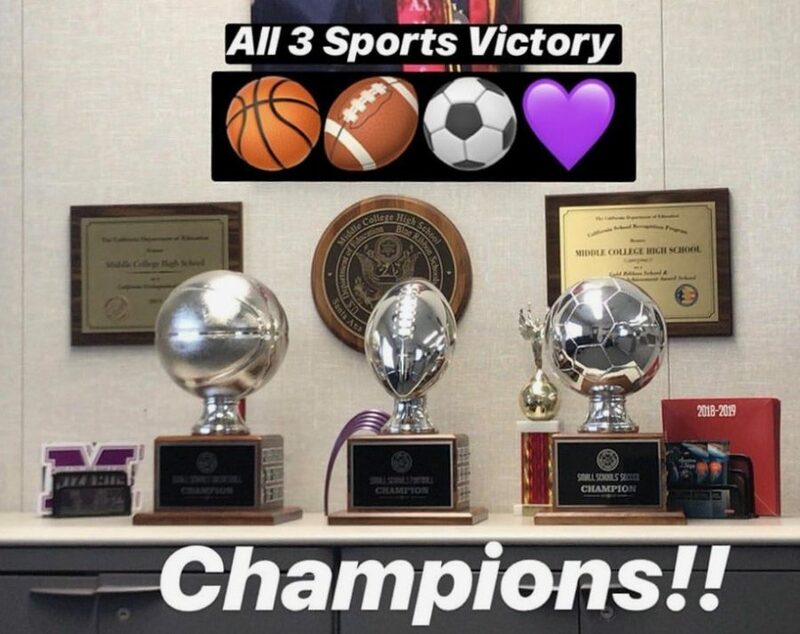 Their success in all three sports can be credited to the great coaching provided by Mr. Ramos, Mr. Curtis, and Mr. Nieto (Mario). All the hard work and dedication the players put into learning their craft made these successes attainable. This is the first time in MCHS’s history where we have won all three sports tournaments. A big part of all three dominant victories against Chavez and Lorin Griset was all the support that there was at all three tournaments. This really encouraged the players to give it their all in order to ensure victory. The year started off with a commanding win in football. MCHS was able to win all three games and take home the trophy. The tournament was held on a day where it was raining all day; this added the extra challenge of trying to catch wet footballs. MCHS players were not fazed by the terrible weather. Instead, they accepted the challenge and scored a touchdown on the very first play. This set the tempo for the rest of the day as all games were high scoring and MCHS never looked back. They were able to comfortably cruise to a victory due to their elite plays. MCHS was able to dominate against the other schools because of the practice the players had to endure. This hard practice ended up benefiting the players as they were better conditioned and better coached than the other schools. Special thanks goes to the coaches, Mr. Ramos, and team captains, seniors Nick Rodriguez and Giovanni Santana, as the victories could not have been possible without them. This was followed up by the basketball tournament. Again, MCHS was able to come away with the victory. The basketball team again had to go through intense training to get to the point where they were able to compete and ultimately end up winning the tournament. The players had a lot to learn in a short amount of time; they had to learn all the offensive plays as well as all the defensive sets. Also, there were many in-game adjustments that the players had to make to ensure that they could win the tournaments. The key to winning the basketball game was playing smart and doing what we practiced and not trying to do to many new things at once. The last and most recent tournament was the soccer tournament. This tournament was especially hard because it was played outside in the heat, and the MCHS players had to play back-to-back games in order to win. The soccer team was able to win because of their superior training and the opposing team’s lack of cohesion on the field. The soccer tournament was difficult because of the physicality that all the teams were playing with. This resulted in multiple minor injuries for all three teams but thanks to MCHS’s depth, they were able to replace the players with capable replacements in order to pull out the victory. Senior Alan Meza said, “The key to victory was that players have been together playing for the team for a long time and that leads to a greater dynamic and chemistry on the field.” The chemistry was evident on the field as it took the entire team to come away with the victory. Coach Mario said the following, “Thanks to everyone, thanks for giving me a chance to apart of Middle College and coach of the soccer team. And lastly thanks to all the players for all their respect and dedication.” Special thanks to Coach Mario and Captain Alan Meza. None of the victories could have been possible without all the support given by the students as it really made a difference. The student body gave the MCHS players an extra incentive to win. This mentality gave MCHS an edge, as they knew that were playing not only as a team, but as a family. To all the seniors that were part of the teams, we would like to thank you for everything that you taught the underclassmen and you will be missed. Also, none of this could have been possible without the coaches or support from student body.